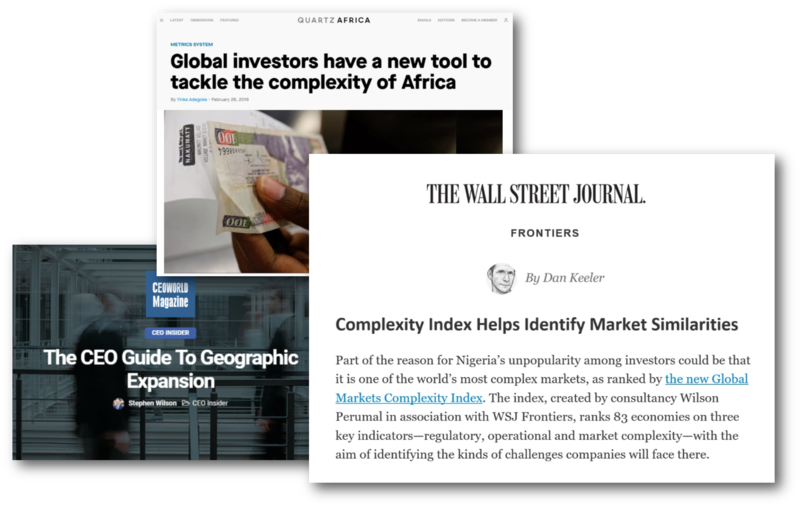 You can also read Quartz's coverage of the GMCI a new tool to tackle complexity and CEOWorld Magazine's feature of the top 5 CEO insights from the 2019 GMCI report. Whether you're a corporate leader seeking to identify adjacency opportunities or a country leader aiming to reduce complexity, this report offers valuable insights. 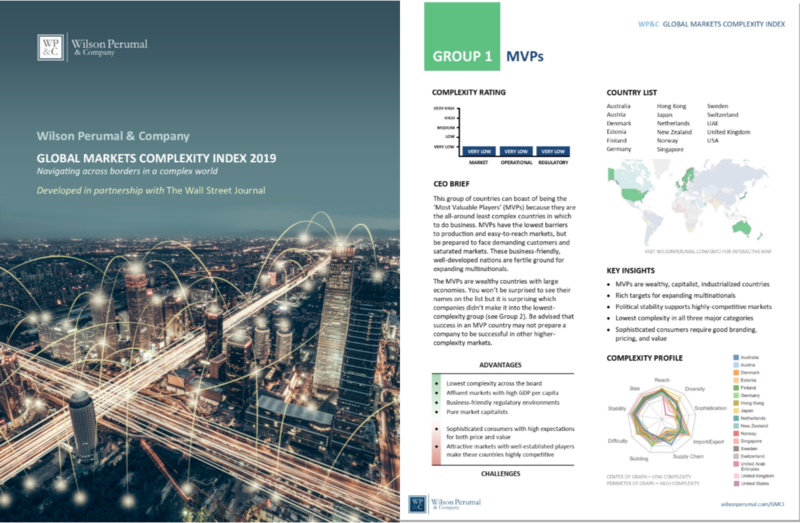 The Global Markets Complexity Index (GMCI) helps executives navigate international expansion by highlighting countries with similar complexity profiles to where they already successfully operate. 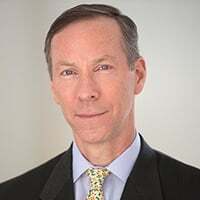 Developed in partnership with The Wall Street Journal, the GMCI seeks to help decision-makers by introducing a new framework for assessing geographic expansion, rooted in an analysis of market, operational, and regulatory complexity across 83 countries. These three categories—and the underlying subcategories detailed in this report—represent the most important dimensions of complexity that businesses encounter when operating in foreign countries. Based on the analysis, we developed country profiles based on different aspects of complexity and classified countries into eight distinct groupings using machine learning. These groups are the crux of the GMCI, informing business leaders of what they may expect expanding into each country and which countries share similar complexity profiles. Given that the focus of this report is the complexity associated with new market expansion, we are laying out here a brief primer on complexity. The world has become vastly more complex in the last decade, with the emergence of new technologies, greater customer variety, global operations, and shifting regulations. In many cases, this is good news for customers—more choice and more convenience. But it represents a substantial shift for companies, many of which are still operating with outdated frameworks and mindsets. Complexity arises at the points of intersection and increases with the number of different things you have in your business. This includes the number of products and services you offer, the number of steps in a process, the number of countries you operate in, the number of different store formats you may have, and so on. 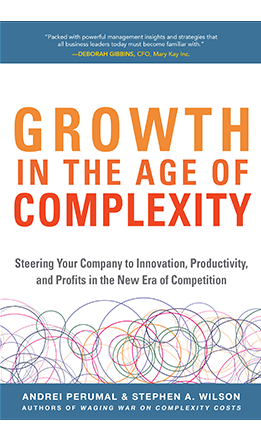 As complexity grows, the costs—and other impacts—of that complexity grow geometrically. With more complexity, service levels deteriorate, customers become overwhelmed by too many choices, and a company’s resources are spread too thin. As we add more complexity to a business, we also increase the potential number of interactions. Our proprietary dashboard and interactive map at the top of the page visually display the GMCI complexity groups, which are the output of the market, operational, and regulatory complexity scoring and subsequent clustering based on those scores. 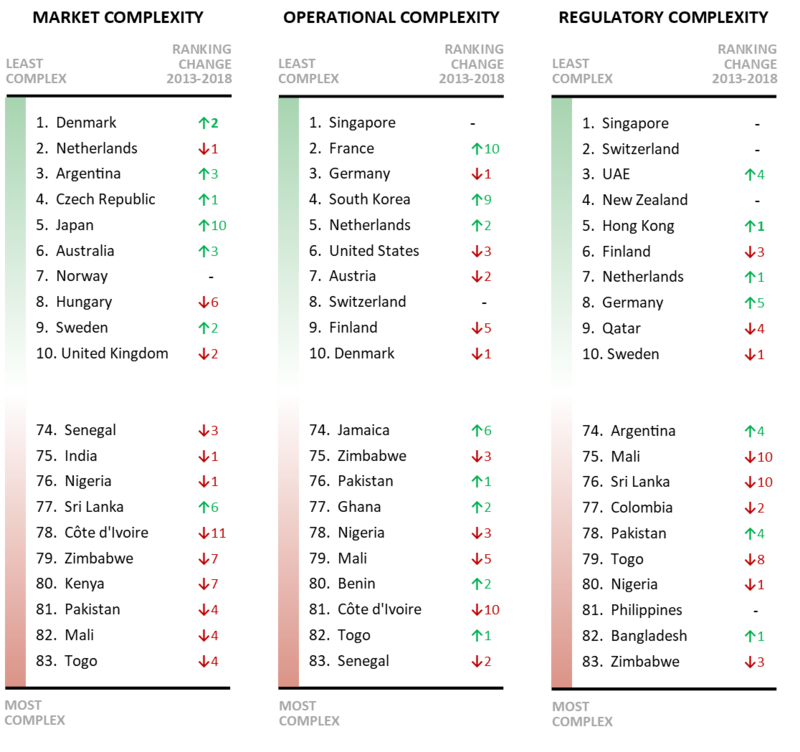 The GMCI uses a scoring system to evaluate complexity across nations and groups countries together based on their scores. After developing the market, operational, and regulatory score for each country, we used clustering, a machine learning technique, to create the country groupings. We believe that the most productive way to view complexity at an international level is through relative comparisons. 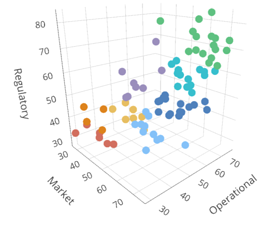 The GMCI allows executives to view over 80 adjacency comparisons from a broad strategic perspective in order to identify where their current capabilities will play best. The GMCI employs an advanced scoring system to evaluate complexity across nations and groups countries together using a machine learning algorithm. The result is a revolutionary view of the world that highlights major trends of complexity to empower better decision making. In this index, a high score represents positive attributes and lower complexity while a low score indicates a high degree of complexity in that dimension. In order to add clarity, scores were partitioned into buckets (very low to very high) based on quintile. These groupings allow comparison of country profiles and group profiles. 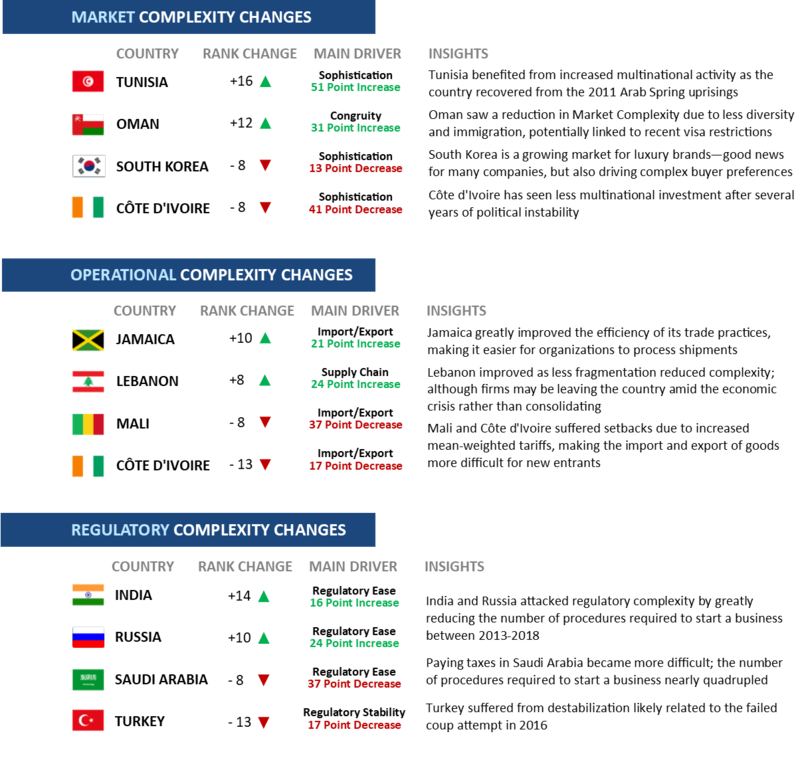 Although we don't see complexity as a game of winners and losers, it is compelling to see which countries are the most and least complex within our measured categories: market, operational, and regulatory complexity. Below we have highlighted the most and least complex countries in each category, noting their change in rank over the last five years. As with any index, it is intriguing to identify the Movers & Shakers—countries that have moved up the charts, and countries that have fallen. Below is the list of which countries have seen the biggest increases or decreases in complexity over the last five years. More than 40% of companies become less profitable as they grow—eroding scale and ultimately impeding their ability to grow. This results from an overreliance on traditional strategy tools and frameworks that are no longer fit for today’s complex world. 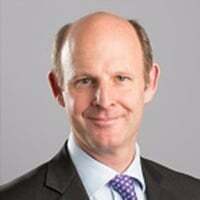 WP&C brings new tools, mindsets, and strategies to ensure growth plans create scale, not dilution.  WP&C works with companies considering potential adjacencies, to help them identify and assess a robust set of alternatives (geographic, product, customer, or otherwise). This involves an external assessment of new market opportunities, an evaluation of the company’s ability to execute, and the subsequent due diligence on specific opportunities. A decade or more of international expansion has left many multinationals overextended, with operations in countries that are not profitable for the business and which distract them from core areas that are better prospects for growth. WP&C helps companies optimize their country portfolio and ensure a fit-for-purpose operating model for each country archetype. 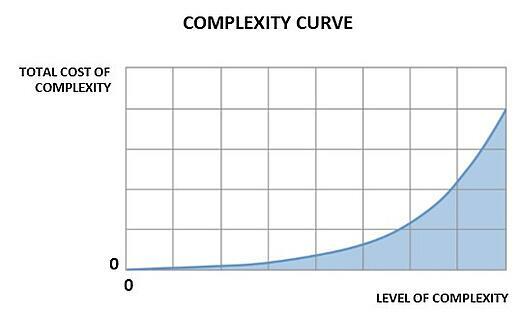 Complexity in a company’s product portfolio, processes, and operations is costly and also inhibits growth. 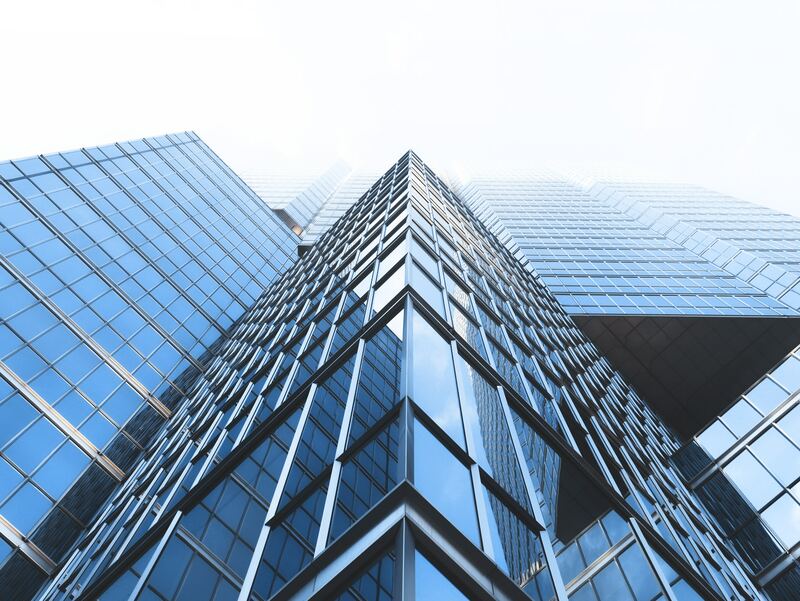 WP&C helps companies simplify, leveraging proprietary methods to help executives understand the cost of complexity and where they truly make money—a foundation for profitable growth. As governments implement policies and strategies that reduce the complexity of operating in their countries, they improve their attractiveness to multinationals. WP&C has a successful track record working with government institutions and improving ease of doing business and overall efficiency. Contact us to learn more: contact@wilsonperumal.com. Learn how we helped a global media organization that was losing tens of millions of dollars per year determine how and where to grow to regain profitability, resulting in digital ad revenue growth of more than 50%. In our latest book, learn how to navigate the Sirens of Growth and build true scale in today’s new era of competition.